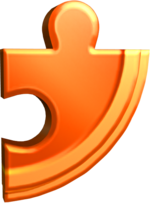 A orange, curved Puzzle Piece. Puzzle Pieces are collectible items that appear in Donkey Kong Country Returns (including its 3DS port) and Donkey Kong Country: Tropical Freeze. As their name implies, Puzzle Pieces are shiny, orange, curved puzzle pieces, and there are either 5, 7, or 9 hidden in every level (except for boss fights). When the Kongs obtain every Puzzle Piece in a level, the player unlocks a new photo in the Image Gallery. Most Puzzle Pieces directly appear in hidden parts of a level itself, but a few are obtained if the Kongs collect every item within a Bonus Stage before the time runs out. On the results screen, after completing a level, the gathered Puzzle Pieces individually make up an image of a fruit. The entire picture is revealed when the Kongs obtain every Puzzle Piece. From the world map, an icon of a Puzzle Piece also appears on a selected level if the Kongs have collected every one in the level itself. This page was last edited on April 2, 2019, at 14:32.